In recent weeks, the Brazilian government has turned to the difficult task of building giant hydroelectric dams in the Amazon River. The project presents President Luiz Inácio Lula da Silva with a major contradiction—between his ambitious economic development plan based on large-scale infrastructure, and the enormous social and environmental costs of the dams. On the one hand, dam construction plays a critical role in the government's large-scale infrastructure initiative called the Program to Accelerate Growth (P.A.C.). The P.A.C. is a multi-year public works program designed to advance economic development by promoting incentives for infrastructure expansion, including building large dams in the Amazon. On the other hand, the president from the Labor Party must confront the reality that the mega-projects in the Amazon could cause enormous and irreversible environmental and social impacts, and that they face considerable obstacles under Brazil's demanding environmental laws. 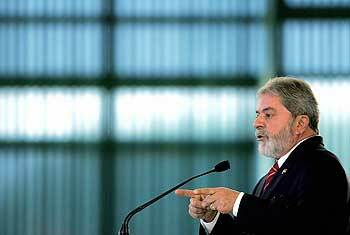 President Lula now faces a major dilemma and so far has responded with frustration and cynicism. The hot-button issue is the plan to build two large dams at the Santo Antônio and Jirau rapids on the Madeira River in the Amazonian state of Rondônia. The projects would dam the Amazon's principal tributary, causing dramatic changes to the riverine ecology and affecting thousands of families who depend on the river for income, nutrition, and agriculture. With a combined generating capacity of 6,450megawatts, government energy planners insist the Madeira dams are essential to avoiding blackouts in the next decade. Yet following more than two years of analysis, Brazil's environmental agency, IBAMA, recently issued a finding that it cannot give the go-ahead for the controversial project, citing insufficient information with which to make a decision. IBAMA ordered the project proponents—Furnas, a state electric company, and Odebrecht, a Brazilian construction giant—to submit a series of complementary studies to determine whether the project is "environmentally feasible," the criteria used under Brazilian law. The companies have now responded, and reportedly, Lula has ordered IBAMA to conditionally approve the project, pending actions that supposedly could "mitigate" some of the project's most serious impacts. IBAMA's decision comes at a time when the Environment Ministry, under the command of internationally renowned environmental advocate and former rubber tapper leader, Marina Silva, is becoming increasingly marginalized within the Lula government. The center-right and conservative political parties that participate in the governing coalition have gained strength and consistently oppose tighter environmental regulation. Still, Lula refused to fire Silva in his latest ministerial shake-up, an indication that her value as a symbol of the administration's commitment to environmental protection is greater than the discomfort caused by her insistence on maintaining environmental protection standards for the big-ticket projects Lula insists are needed to spur the country's economic growth. The Brazilian electric sector has launched a torrent of criticism against the environment minister, claiming that IBAMA is holding up Brazil's development. Silva has held steadfast in affirming that "there is no timetable for approving the Madeira project." This has led the general director of Brazil's Electrical Energy Agency, Jerson Kelman, to propose moving decision-making power for "strategic projects" (read, large dams in the Amazon and nuclear plants) out of the hands of IBAMA and placing it within the jurisdiction of the National Defense Council, an advisory body with participation of the military, among other government sectors. Minister Silva did yield to pressure by announcing the restructuring of IBAMA, splitting the agency into two separate bodies, one entirely devoted to environmental licensing, and the other to administering protected areas, even though it is difficult to see how this will substantively break the deepening impasse. Facing impending cuts in budget and staff, IBAMA employees have gone out on strike, forcing the agency to hire consultants to complete the Madeira project's licensing. A bill currently in the federal parliament would overturn constitutional human rights guarantees for indigenous peoples facing plans for hydroelectric dams on their lands, instead obliging them to accept royalties. Brazil's constitution holds that indigenous peoples "be heard" regarding plans for dams affecting their territories, a provision which courts have interpreted as requiring their informed consent. The Madeira dam projects are indicative of the rough waters the government will have to navigate if it continues with plans to construct more than 60 large dams on the major rivers of Amazônia in the coming decades. The tendency has been to treat these projects as "a done deal." In the words of Brazilian energy specialist Sérgio Bajay of the University of Campinas, the electric sector wields "an iron hand." The government and companies deny that the project will have far-reaching impacts. An Odebrecht executive told a public hearing in Rondônia last May that "this is a different kind of dam project—it has nearly no impact on the environment." Yet, independent studies commissioned by the state public 'attorney's office in Rondônia and by IBAMA confirm what environmentalists and social movements have feared—that the Madeira project would cause enormous impacts. These would be felt over thousands of kilometers, from the mouth of the mighty Amazon and up the Madeira into neighboring Bolivia and Peru. A principal factor is the Madeira's extremely high sediment load—the river carries millions of tons of clay, sand, and silt from the Andean slopes where it is born to the Amazon River, where it accounts for half of all the sediments along the lower Amazon. Studies have shown that when the dams begin operation, the upstream Jirau reservoir would fill up with sediments, extending the flooded area into rainforests in neighboring Bolivia. The retention of these sediments behind the walls of the dams would also rob downstream floodplains of the precious nutrients that fertilize agricultural lands and help sustain the Madeira's incredible biodiversity—there are 750 fish species and 800 bird species along the ecological corridor of the Madeira. Government pressure on IBAMA to liberate the license for the project has received a boost from a study by a World Bank-funded hydrological consultant, who said that all the sediments would pass through the turbines, eliminating any impacts they would otherwise cause. Another serious impact identified is the dams' potential effects on migratory fish species. Some swim more than 3,000 kilometers each year to the Madeira's upstream tributaries to spawn. Scientists suspect that the homing instinct of these fish would continue to attract them to the Madeira, and that with access to their reproductive areas being blocked by the dams, several important species could become extinct. These species serve as a principal protein source for tens of thousands of riverbank dwellers along the Madeira and Amazon, and also have considerable economic value, both for artisanal fisherfolk and industrial fisheries. This finding led Lula to comment cynically that "environmentalists are trying to dump some catfish on my lap" by opposing the Madeira project. The project's effects on Bolivia could eventually block the project from moving ahead. Brazilian government officials (other than IBAMA) have tried to ignore the fact that for Brazil to build a dam that floods the territory of a neighboring country would require negotiating a complex set of treaties, in the absence of which Brazil would be guilty of violating international law. Evo Morales told Lula at a meeting in January that his government was concerned about the Madeira project's impacts. Lula responded by offering to finance a bi-national dam upstream, between Brazil and Bolivia, which has been planned within the framework of the South American Initiative for the Integration of Regional Infrastructure (IIRSA). Morales reportedly declined the offer. Bolivia's Environment Directorate has been analyzing the technical studies for the project, and its recommendations are now being discussed by the Morales government, which is expected to take a definitive position regarding the project in the next few weeks. With the Bolivian government skirmishing with Brazil over the nationalization of Petrobras' interests in the country, Morales' decision on whether or not to oppose the Madeira dams could be tempered by other geopolitical and economic considerations. In addition to serious questions regarding the project's environmental feasibility, Brazil may have trouble attracting sufficient private investment in the project due to questions about its economic viability. Originally proposed as a source of cheap energy for the national grid, the project's budget continues to grow. The latest estimate by the Brazilian Electrical Agency, Agência Nacional de Energia Elétrica (ANEEL), sets the cost for the Santo Antônio and Jirau dams at US$13.2 billion, not including the additional cost—estimated by the government at up to US$7.5 billion—of constructing 2,400 kilometers of transmission lines to connect with the central electricity grid. It also doesn't include the costs of navigation locks, and the costs of building upstream dams to flood a series of rapids, making it possible for barges to travel from the mouth of the Amazon to the upper stretches of the Madeira's tributaries. Brazil's National Economic and Social Development Bank, BNDES, has offered generous financial terms as part of the P.A.C. program, and the Brazilian government has discussed financing with the Inter-American Development Bank and World Bank. But indications are that most private investors are carefully analyzing the dams' economics, as well as its potential environmental problems, before embracing the project. Cláudio Sales, coordinator of an association of Brazilian electrical utilities, the Instituto Acende Brasil, said, "We know that Pharaonic projects like this, run by state companies, always exceed their initial costs and timeframes." Also as part of P.A.C., the Brazilian government is attempting to license another dam at Belo Monte, with a planned generating capacity of 11,182 megawatts. This would be the first of a series of dams planned for the Xingu River, another Amazon tributary. The dam would displace at least 16,000 people, and would directly affect 450 indigenous people. Environmental studies have so far been blocked from being carried out by a lawsuit filed by federal attorneys, on the grounds that IBAMA has not yet established terms of reference for the studies. Indigenous populations from throughout the Xingu basin met recently to voice their opposition to this project. The Mines and Energy Ministry has already announced that another huge dam, São Luís, on the Tapajós River, with a capacity of more than 9,000 megawatts, will be the next giant project the government plans to promote. Other major Amazonian rivers, such as the Araguaia and Trombetas, are also slated for damming. It is clear that the Lula government will continue to press for the licensing of the Madeira dams. IBAMA, which has had to continually defend its role in carefully analyzing the impacts of the projects, will surely find it impossible to resist the barrage of political criticism it is receiving. For this reason, the final decision on whether or not to go ahead with the Madeira complex will be made on political rather than technical grounds. What is far less likely to take place will be an analysis of the alternatives to the Madeira complex, and the other mega-hydroelectric projects being planned for Amazônia. The Brazilian electric sector has angrily attacked anyone, including the conservation organization World Wide Fund for Nature (WWF), who has dared to imply that energy efficiency or energy alternatives could well take up the slack if the country wished to avoid destroying the Amazon. Studies by energy specialists showing that retrofitting older dams already in operation and cutting transmission losses could provide a significant quantity of new energy, at low cost and with nearly no environmental impacts, have been rejected as utopian and wishful thinking. The economic interests of construction conglomerates that finance a major part of Brazil's political campaigns, and the corruption that permeates the multi-billion dollar projects (Brazil's Mines and Energy Minister recently was forced to quit when the Federal Police filmed the director of a construction company delivering an envelope with money to his cabinet) that the Lula government considers "strategic" for the country, speak more loudly than scientists and technical experts, and the voices of river bank communities along the Amazon are not heard in Brasilia. The future of the Amazon may well depend on whether diplomatic and legal conflicts can hold Lula's Pharaonic vision of Brazilian development in check, forcing energy planners to seek an alternative path. Glenn Switkes is director of International Rivers Network's Latin America office, based in São Paulo and a contributor to the Americas Program at www.americaspolicy.org.